Created and compiled by Charles Krauthammer before his death, The Point of It All is a powerful collection of the influential columnist's most important works. Spanning the personal, the political and the philosophical, it includes never-before-published speeches and a major new essay about the effect of today's populist movements on the future of global democracy. Edited and with an introduction by the columnist's son, Daniel Krauthammer, it is the most intimate and profound book yet by the legendary writer and thinker. In his decades of work as America's preeminent political commentator, Charles Krauthammer elevated the opinion column to a form of art. Whether writing about statecraft and foreign policy or reflecting on more esoteric topics such as baseball, spaceflight and medical ethics, Krauthammer was beloved not only for his penetrating wit and insight but also for his ability to identify the hidden moral truths that animate our politics and culture. This new collection, which Krauthammer composed before his death in June 2018, features the columns, speeches and unpublished writings that showcase the best of his original thought and his last, enduring words on the state of American politics, the nature of liberal democracy and the course of world history. The book also includes a deeply personal section offering insight into Krauthammer's beliefs about what mattered most to him--friendship, family and the principles he lived by--all anchored by Daniel Krauthammer's poignant eulogy for his father. For longtime readers and newcomers alike, The Point of It All is a timely demonstration of what it means to cut through the noise of petty politics with clarity, integrity and intellectual fortitude. 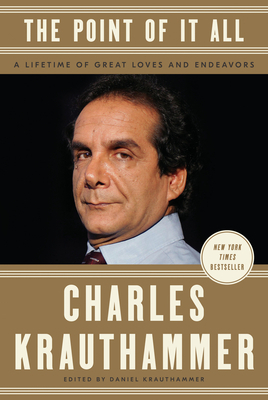 It is a reminder of what made Charles Krauthammer the most celebrated American columnist and political thinker of his generation, a revealing look at the man behind the words and a lasting testament to his belief that anyone with an open and honest mind can grapple deeply with the most urgent questions in politics and in life. Charles Krauthammer, winner of the Pulitzer Prize, was a syndicated columnist, political commentator, physician and bestselling author. His Washington Post column ran weekly for 33 years and was syndicated in more than 400 newspapers worldwide. For over a decade he was a nightly panelist on Fox News’ flagship evening-news broadcast Special Report. He served as a member of the President’s Council on Bioethics and he was a member of Chess Journalists of America. Along with his wife Robyn, he cofounded Pro Musica Hebraica. He died on June 21, 2018. Daniel Krauthammer’s writing has appeared in The Weekly Standard, National Review and The New Republic. He holds degrees from Harvard, Oxford and Stanford in political science, economics and business administration, and has worked in government as well as in the entertainment and technology sectors. He spent the last year of his father’s life close by his side in the hospital, where together they worked toward completing this book.